HSMAdvisor Machine Cloud Fixed ! I have been really busy lately working on the large update for HSMAdvisor- Mastercam plugin that it totally slipped from me that Machine Cloud services were down. Thanks to everybody who reported the issue! FSWizard Machinist Calculator Update that iOS users will like: new big drop-down select boxes replaced the standard iOS spinners make it easier to select Tools, Tool Materials and Coatings. Because of this we will soon also be able to show tool images as well! In this update a lot of work was done to make it work flawlessly for iOS devices. Update: I have received emails saying that lots of people's purchasing and accounting departments were closed during this time, so the sale has been extended by one week until January 12! Only during these 5 days you will be able to save 50% on any and all HSMAdvisor and/or FSWizard packages, sold on our https://HSMAdvisor.com store! Do not miss the only deal of the year! The HSMAdvisor hook for MasterCAM has been updated! Tapered End Mill Display: The work-piece material boundary now matches the angle of the cutter. Shoulder Diameter: Default shoulder diameter is now equal to either the diameter of the Shank or top of Fluted portion, depending on the tool configuration. Tool Ordering: Fixed ordering issues. Improved Default Tool Library behavior. 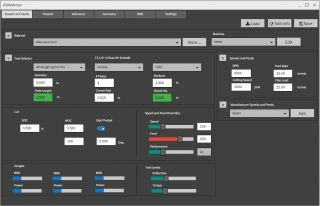 HSMAdvisor Machinist Calculator is now sporting the new even cooler look! So I finally got tired of the old ugly design the FSWizard.com web site was sporting and updated it at bit. Complete with actual reviews from the app stores and screenshots! That was more work than I thought! I have decided to upload the new HSMAdvisor Release Candidate here. I still have to do some work to the "Light" theme to make things more visually appealing, but i think i did a lot of work with simplification of the UI. Please find the download link below as this update is not yet available (and will not be) as an official HSMAdvisor release. Also if you have nay feedback (good or bad) please Contact me! IF you were wondering if i had fallen of the face of the earth, here is what i was up to. I have been developing a new cleaner look for HSMAdvisor (see the attachment). First thing you notice is the Dark background color. I plan to make that the new default background. 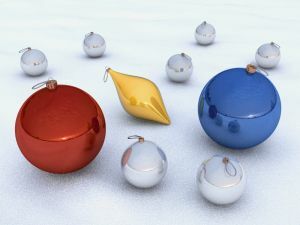 The color theme will be configurable to appeal to those who want to stay on the light side. Label positioning will change to above the input fields, because it seems to make it easier on the eyes to associate the label and the field. The Tool and Cut drop-downs will be removed along with the "menu" buttons on the right of them. Tool and Cut selection will be moved to "Load Tool/Cut" buttons. I believe the Load Tool/Cut dialog to be the better option. Tool Limits and Speed and Feed Overrides expandable panels will be merged with Gauges and Cut Data panels respectively. This will further lighten up the interface. Soon I will publish a test version for our users to try out before i make it an official update. Do you have any feedback on the changes I am making? Make it known, because it is supposed to be done for your convenience! So yesterday I published another update to FSWizard calculator. Unlike the last times this one includes the FSWizard.com web app as well. From this point on both the mobile and the Web app will be updated at the same time. The update includes some bug fixes and new G-Code reference page, that will be updated with more codes as we go. This update marks a major pivot in HSMAdvisor development. Behind the scenes the groung-work has been laid for tight integration between HSMAdvisor and FSWizard. Next steps will include sharing of the tool and cut data with the FSWizard mobile app. New materials: DME Steel 1, 2,3 & 7 and others. 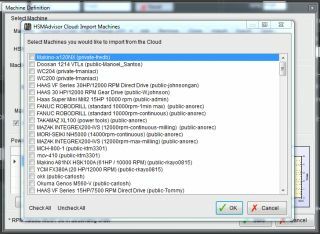 Improved Machine Definitions: Program now does not allow to upload duplicate machines to the cloud: you need to clone your machine first. Thank you, our supporters, for the continuing feedback and support!